At the beginning of this year, after two recent house moves, I was very conscious of the amount of stuff I own, including clothes, which had increased as I introduced extra to deal with the cooler Melbourne weather. I also took a look at the clothes that had been piling up in need of mending and decided to finally do something about it. I began my monthly instagram project #midmonthmending, partly because I had the time, but also because I didn't want to waste money on clothes unnecessarily while I'm not working. What really pushed me over the edge in regards to my wardrobe though, was studying sustainability this semester as it relates to the textile industry. Prior to this, I would have said I was pretty sustainability-savvy. I've spent the last ten years working for, what was, in part, an environmental consultancy and had previously started a Masters in Environmental Management for goodness sake, yet I was totally unprepared for how shockingly bad the textile and fashion industries are in every aspect of the product lifecycle and in every facet of sustainability – environmental, social and financial. So, this is the first in my monthly series on building a sustainable wardrobe, which will go through the fashion lifecycle from raw materials, through processing, garment construction, garment care and end-of-life. I'm hoping though, that instead of leaving you thoroughly depressed, I'll also give you ideas for your own wardrobe and examples of places that are doing the right thing. This is a breakdown of my wardrobe, not including underwear or shoes, but including pyjamas and gym gear. 167 items. This was the first thing that shocked me – it's too much. I'm not sure what I think would be enough, but I think this is too much. 'Enough' will need to be something I work out in the coming months. As I sorted through clothes, documenting quantities, where they were made, what they were made from and how long I'd owned them, I decided that I'm going to see how long I can go without buying any more. I have roughly 50 outfits in my wardrobe – 50! In 1929 the average middle class woman owned about nine outfits, she would have spent approximately 15 per cent of her income purchasing these items, and would never have considered throwing them out. 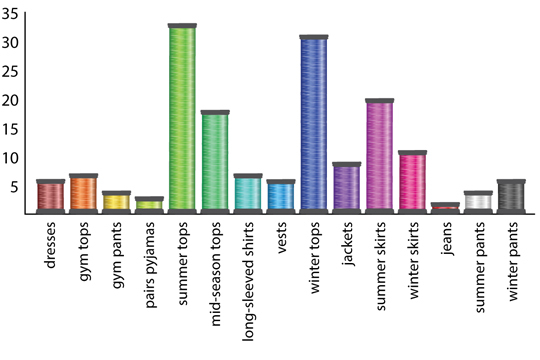 These days Americans spend something like four per cent of their income on clothing (Overdressed – EL Cline). Although I can't find a lot of data for Australia, I'm sure the situation here is the same. According to the movie 'The True Cost', we buy 400 per cent more clothes than we did 20 years ago, yet as you can see, as a percentage of our household expenditure it's costing less. How is this even possible? I can actually pinpoint the year my clothing purchases increased. It was 2007 and I'd received a promotion at work. We were also moving our offices from a funky, arty neighbourhood, to the CBD of Sydney. I couldn't get away with wearing jeans to work anymore. This wasn't just in my head, but rather actual conversations with my boss. He wanted me to start wearing a suit to work. For anyone that knows me, that was never going to happen, but I did have to make quite a number of additions to my wardrobe to make it more suitable. Anyway, I'm not going to beat myself up over what's been done. I do tend to buy quality over quantity and there is an item of clothing in my wardrobe that's 30 years old and I still wear it! I'm also of a generation that remembers buying one special outfit each season, and clothes that came with extra material to take down a hem. And thankfully I'm past the age that the worst of fast fashion is aimed at. If you want to take a look at the rate at which some of the millennials are consuming, type 'clothing haul' into the YouTube search engine for a bit of an eye-opener! So, that's my clothes accounted for. Where to from here? Well, next month I'll look at the fibres we use to make our clothes, the ones that make up my wardrobe and what choices I'll make from here on in. If you want to find out a bit more about sustainability (or extreme lack thereof) in the fashion industry, please watch 'The True Cost'. It was released just this week. I saw it on Friday night and it makes powerful, if depressing viewing. I'm not sure how wide its release will be in cinemas, but you can download it from iTunes for just over $10 AUD. Or for shorter viewing, you can watch Last Week Tonight's John Oliver on fast fashion here. Language warning for that one! If you're wanting some inspiration about your own 'stuff', grab a copy of James Wallman's 'Stuffocation – Living More with Less' (it's probably in your local library). James is all about the shift from consumption to experiences. The Minimalists are also worth looking at. They really are about getting rid of your stuff in an effort to make you happier, and not in a 'decluttering each year so you've got room for more stuff' kind of way. And lastly, Bea Johnson of 'Zero Waste Home', who was recently featured on Radio National, writes a blog and has an Instagram feed. Bea's wardrobe consists of just 47 items! This includes underwear, shoes and accessories. I'm not sure I'll be aiming for that low, but it will be interesting to see where I end up! Love it Tara - like Mary I will try and follow each of the steps - but time is not on my side until Mid August so will attempt then :) I think your biggest feat would be getting Grub onto the cause!! !